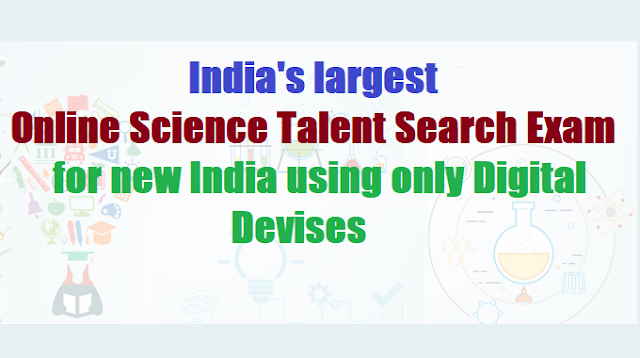 India's largest Online Science talent search exam for new India using only digital devises. Vigyan Vidhyarthi Manthan 2018-18 - India's largest talent search examination for new India using only digital devises: ‘World’s largest Science Talent Contest’, National Science Talent Contest’. VVM/Vidyarthi Vigyan Manthan National Science Talent Contest 2018. Vidyarthi Vigyan Manthan (VVM) is a national science talent search programme for New India organised by VIBHA (Vijnana Bharati), in collaboration with NCERT- Ministry of Human Resources and Development and Vigyan Prasar- an autonomous organization under the Department of Science and Technology, Government of India. VVM is a National program for educating and popularizing science among school students of VI to XI standards. VVM aims to identify and nurture the bright minds among the student community, who are keen on subjects related to science. SCERT Telangana - Rc. No.1011/A/C&T/SCERT-TS/2018 Dated:2.3-08-2018:: Sub:- SCERT, Telangana, Hyderabad - Vidyarthi Vigyan Manthan 2018-18 - Indias Largest Talent Search Examination for new India using only digital devices - Reg. Ref:- Lr.No.VP/058/47/A&AVVM/2018, Dt. 16-8-2018 of National Convener, Vignan Prasar, New Delhi. The first level of this Science Talent Search Examination will be conducted online for students of class VI to VIII (Jr. Group) and class IX to XI. The participation fee is Rs. 100/- per student for students from public and private schools. The syllabus for the examination will be from the Science and Mathematics Textbooks of respective state boards / NCERT (40 marks). logic / reasoning/general knowledge (20 marks). Study material will be uploaded by them for the syllabus on Indian Contribution in science and life of Dr. Homi Bhaba and Dr. Vikram Sarabhai in their website. No printed material given. The duration of the exam will be for 2 hours (11.00 A.M to 1.00 P.M). The mode of exam will be online using mobile phone/ tablet / laptop. 5) Local Vigyan Bharathi will be conducting orientation programme for the school teachers to propagate this programme. 6) The successful candidates will be awarded at School level, District level, State level, Zonal level & National level. For effective implementation of the programme VVM-2018 in the State, Vigyan Bharathi of Telangana state has taken responsibility to coordinate this programme. Dr. Perugu Shyam, Cont No. 9948561761, Email : shyambiachem@gmail.com is nominated as state Convener for Telangana on voluntary basis and can be contacted for more information about this programme. Therefore all the DEOs in the state are requested to take necessary action in giving vide publicity to participate the students in the science talent search examinations as per schedule and communicate to the schools. The Broacher of VVM -2018-18 is attached with this proceedings for ready reference. Action may be taken accordingly.